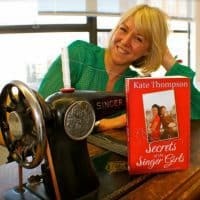 This week, in my bid to introduce readers to authors they may not have read before, I’m thrilled to welcome Kate Thompson onto my blog on the very day her new book The Wedding Girls is launched. Kate is a fellow PanMacmillan author and writes about wartime women. It’s a hugely popular period with readers, though not one I’d read a lot of myself until I dipped into Kate’s books last year and was happily lost. Anna Belfrage suggested to me last week that ‘historical fiction’ should not be a genre because at heart we write books about the human condition, not just about a specific period, and I do think that Kate Thompson’s warm, entertaining, gripping novels prove her right. Kate writes about women we can all relate to, whether we normally read ‘historical fiction’ or not. Kate’s books evoke the nostalgia and drama of life in the working-class communities of the East End, which she absolutely adores. Indeed, she swears that in a previous life she was a potty-mouthed seamstress from Bethnal Green, dodging bombs during the Second World War! Chiefly, she tries to highlight how remarkable the women of 1930s and ’40s Britain were. They saw their worlds changed beyond measure and experienced emancipation, but also extreme danger and deprivation. Kate hates the word ‘stoic’ but has to admit that that’s what they were. She also tries to explore the importance of communities. East End neighbourhoods were fascinating places back then and she’s spent so many hours surrounded by women in their nineties, who have told her the most remarkable, sad, funny and heart wrenching stories, not just about the war years, but also of the grinding poverty of the Depression years, the hardships of which remained indelibly inked into their minds. The narrow East End streets these women roamed through in the 1930s may have been hard and brutal, but they also contained within them a golden world of community and camaraderie. Kate believes that it is often the quiet voices of history, which are the most revealing and her books bear that out. They are about women whose unassuming thoughts and feelings told her so much about how difficult, but also how rewarding it was to be a woman back then. The East End, in common with all working class communities, was a fiercely matriarchal society. Women in cross-over aprons and button-down boots were the beating heart of the East End. It is they who ruled the cobbles, kept the children fed, birthed the babies and laid out the dead. The Wedding Girls – out today! - is set in an East End photographic portrait studio in 1936, and is all about the relationship between a photographer and the neighbourhood he serves, as well as summoning up the vibrant glamour and escapism of pre-war weddings. In researching it, Kate stumbled upon a lost world of innocence and hope. A time when divorce was never a seriously considered option, girls’ married for life and weddings were about love, community and family, not sugared almonds and selfies. Glamorous weddings were a reaction to the horrors of the Great War and that, combined with the emergence of Hollywood, meant brides were determined to sprinkle a dusting of romance and escapism over the most important day of their lives. Because there was nothing else I ever wanted to do. (Apart from some fantastical idea about being a dolphin trainer when I was 7) I always enjoyed creative writing at school, and after leaving with truly woeful exam results, I decided to get out in the world of work. Training to be a journalist enabled me to do that. I did a one-year NCTJ Journalism course, then talked my way into a job at Fleet Street News agency at the age of 19. Twenty-three years on, I’m still writing. Magazines lead to newspapers, to ghost-writing, to where I am now, the wonderful world of historical fiction! Without doubt, not having to join the rat race and commute into a 9 to 5 job. I love the freedom of setting my own work agenda. It often means I work weekends and evenings, but who cares? I used to feel as if my soul was slowly being sucked out when I queued up in crowds five deep to squash onto a crowded, delayed train. I get to meet fascinating people and make up stories for a living. What could be better? I often find it hard to switch off and define the boundary between work and home. Last Sunday, I was just about to turn off the light and go to sleep, when I thought of something I’d really like to include in my new book, so up I leapt to write it down and before I know it, I’m writing away at midnight. When your office is your spare bedroom, you’d be surprised how many times you nip in when you’re not supposed to be working. I need to be stricter with myself about carving out work-free weekends. Why were you drawn to the wartime period? I suppose because life has changed so much. We will never be able to walk through those neighbourhoods again. They are lost to us, but in writing about them, I can evoke the nostalgia of the past. I know we look back through a prism, filtering out all that was bad about Britain before the welfare state - lack of education, disease and poverty to name a but a few – but in an ever changing world, nostalgia fiction offers a refuge to return to. A place that was simpler and kinder. Why else have programmes like Call the Midwife and Downton Abbey enjoyed such success? I’m very into the Victorian era right now. I just finished Sarah Waters dark, ingenious novel, Fingersmith, which is superb. When she writes about the crooked alleys and passages of Victorian London, peopled by fingersmiths and fraudsters, I’m right there. It’s intensely atmospheric. She writes with such confidence and authenticity. What do you think is the appeal of historical fiction? The ability to be transported out of our world and into another. There is an element of pure escapism to snuggling up with a good piece of historical fiction. I’m intensely aware of this when I write, and spend a long time trying to weed out any anachronisms, not for a minute do I think I’m always successful in that mind you, but when you’re taking people back in time, you really don’t want anything to jar, and ruin that experience. If there was one thing in history you could change what would it be? What else could it be but the birth of Hitler? I’m not saying WW2 would not have happened, but would six million Jews have died in the Holocaust? You can find Kate's books on her amazon page, find out more about her on her website, connect with her on facebook or twitter, or email her direct. Or do pop onto my facebook page to discuss this post.